Boost is now an industry standard with newer mountain bikes. Most new forks have boost spacing but a lot of riders still use non-boost wheels. MRP allows you to keep your existing non-boost wheels and use a newer boost fork. The MRP Better Boost Adapter kit is designed to convert 2013 and newer Industry Nine Torch hubs from 15mm x 100mm spacing to 15mm x 110mm spacing. 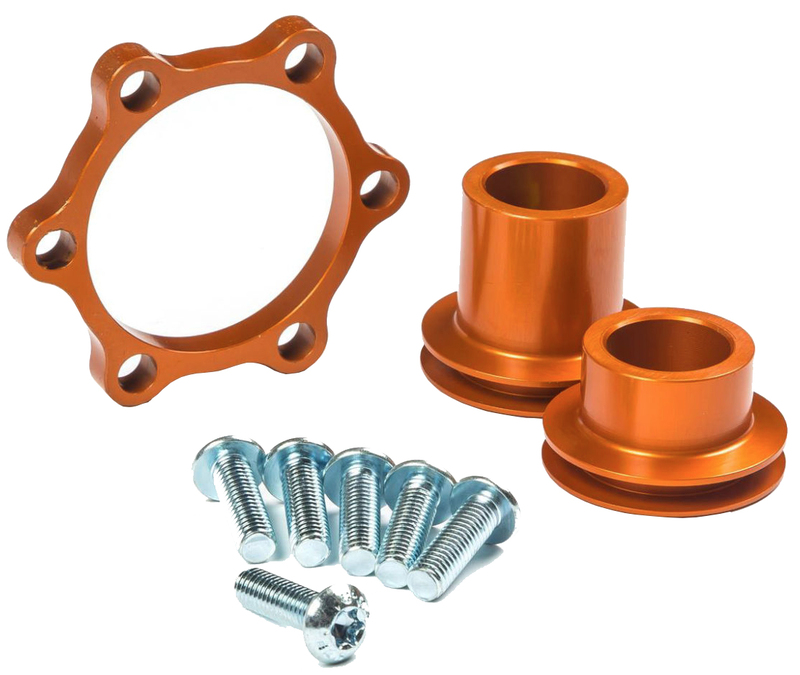 The Better Boost Adapter kit comes with two precisely machined end caps, a brake spacer and six extra long T25 rotor bolts. The best part is your wheel does not require any dishing after the kit is installed. Great adapter that is easy to install. I wish it came in different colors like the I9 Torch hubs. Overall Solid Kit. Machining is nice and Bolts are harder then normal disc bolts. (gauging this off the t25 head not warping during tightening.) Main Gripe: The Anodized finish caused these to be too tight to fit the hub. I sanded down inner axle portion just enough to loose the coating and they fit great. Also kit is black FYI. Zeros for this product. The diameter looks identical to the stock I9 endcaps but they must be slightly larger because they will not press into the hub bearings. I can only attribute that to MRP machining the caps incorrectly. Zeros on customer service as well. I’ve left messages and sent an email and haven’t heard back. It’s been four days. Boooo. Also the listing says orange but they are black. Have you had many issues with the end caps being slightly too large to fit in the hub bearing? BEST ANSWER: yes i did. it is as if i9 forgot to calculate the thickness of adding anodizing when making the adapter. i just removed the anodizing where it goes internal of bearing and all is good. Thanks for reaching out about your I9 Better Boost adapters. We have seen a few tolerance alignment problems with a handful of the I9 hubs where the bearing is slightly on the tight side and the end cap is slightly on the tight side. To remedy this we have adjusted our tolerances and are in the process of making new end caps that I would be happy to send out to you if I can get your mailing address. I did have issues but it was not the caps but the o rings were too large. When I used the o ring from my original caps it worked fine. Same. I did took theirs off and it works now. I removed the o-rings from the Mrp end caps and used my stock o-rings from my original end caps. I could not get them in either. Seems like several of us had this problem. I find it funny that now of the photos even show these come with o-rings. I took theirs off and made it work.